Quirks are aspects of a character’s personality, background, or physique that makes him better at some activities and worse at others. Quirks are not mutations, but in many ways they resemble both perks and flaws. Each quirk provides some benefit, but carries a corresponding drawback. 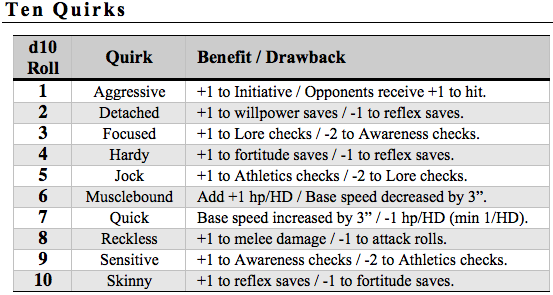 In addition to their game effects, quirks suggest personality characteristics that might lead to interesting roleplaying opportunities. Quirks are typically determined during PC creation, and there is a maximum of 1 quirk per character. If the referee allows it, players may add quirks to experienced characters. A player may be allowed to assign a quirk to his character after he has roleplayed the PC in a manner consistent with the quirk in question, or after a traumatic or life-changing experience. This entry was posted on 21-Jan-11 at 04:42 and is filed under Game Rules, Minimalist with tags House Rules, Post-Apocalyptic, Quirks, RPG. You can follow any responses to this entry through the RSS 2.0 feed. You can skip to the end and leave a response. Pinging is currently not allowed. Biologist – the character receives a +2 bonus to Lore checks related to living creatures (including medical treatment), but has a -2 penalty to all other Lore checks (including Decipher Artifact rolls). K-slacker, I like the Marksman quirk. The +1 to projectiles (crossbows, bows, etc) makes sense.